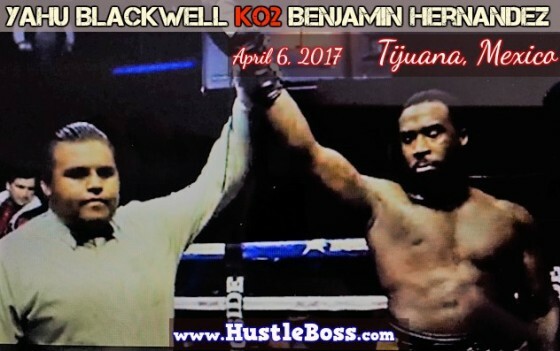 A few days ago we posted that Cruiserweight prospect Yahu “Rock” Blackwell would be fighting in Tijuana, Mexico against Alvarez Vasquez. Sure enough, last night Blackwell would end up scoring a 2nd round knockout, albeit against a different opponent. A last-minute switch saw Benjamin Hernandez jump in to face off with Blackwell, but he wasn’t able to offer much resistance. After viewing a highlight of the match, it was clear to see why Blackwell marched towards a second round knockout. Hernandez had little firepower to offer of his own and Blackwell controlled the action with sharp, precise counters. Hernandez was dropped in round two and unable to continue, thus granting Blackwell with the victory. Check below for a closer look at stay tuned for more of Blackwell’s story.